“The rewards from working in travel have nothing to do with money. “Why” I work in travel is summed up in the excited email I received from a client. I’d helped him arrange a surprise birthday gift for his wife – he wanted to take her to Disney to celebrate her retirement, cross off a “bucket list” trip, fete her at the best restaurants, have her meet “Winnie the Pooh,”, and generally act like a kid again. Working for Sheila is always a pleasure. Sheila has so much to offer when discussing travel. I felt especially reassured this time around when discussing my travel plans with Sheila, because of all the terrible storms/hurricanes that took place in the Caribbean late last year. 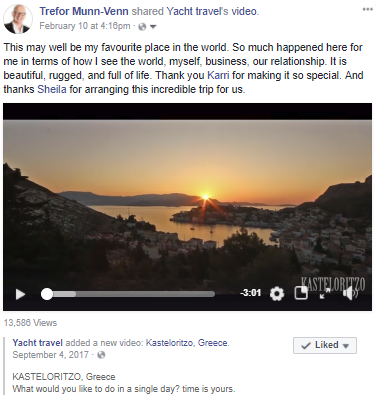 I had several concerns about the safety of travelling to these areas, and I wanted to ask someone i could trust, and I thought of Sheila right away. Our trip to Riviera Maya was great – the flights were on time, accommodations were good, and everything else was great too. We enjoyed our trip. Thank you again. I love getting client reviews. Working with Sheila is always a pleasure. She sweats the details so I can focus on the fun stuff! 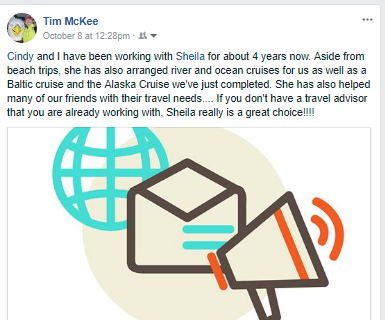 I’ve used other adviser/agents in the past but now Sheila is my one and only travel adviser and I recommend her to others I know all the time.